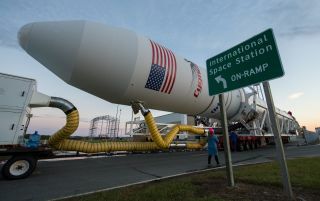 The Orbital ATK Antares rocket carrying the Cygnus cargo ship rolls out to its Pad-0A launchpad at NASA's Wallops Flight Facility on Wallops Island, Virginia for the Oct. 16, 2016 launch of more than 2 tons of NASA cargo to the International Space Station. A spacecraft carrying cargo to the International Space Station is scheduled to launch Sunday (Oct. 16), and it's packed full of new science experiments. Included in the science payload headed to the station are two experiments involving fire in space, a new batch of small experiments from the private company NanoRacks and a test version of a new device that works sort of like a back massager for space experiments. The Spacecraft Fire Experiment II or Saffire-II, is a follow-up to the Saffire-I experiment in which a fire was intentionally ignited inside a Cygnus spacecraft as it fell back to Earth. Prior to Saffire-I, there had been no controlled fires set in space that were larger than an index card, according to David Urban, principal investigator for Saffire-II at NASA's Glenn Research Center in Cleveland, who spoke during a media briefing last week. Urban noted that every type of inhabited structure and vehicle on Earth has undergone "full-scale fire testing," but spacecraft have not. He said the Saffire experiments are teaching researchers about the ways that different factors can influence the spread of the fire, such as air blowing through the craft or the size of ducts that circulate air. Saffire-I and -III (the latter of which has not yet launched) both involve igniting a single piece of special cloth; Saffire-II will ignite nine different sample of materials that are used routinely on the space station, including flame-retardant fabrics used for astronaut clothing, Plexiglas used for station windows and structures used for storage containers, according to a description of the Saffire mission on NASA's website. When a flame burns at about 1,112 degrees Fahrenheit (600 degrees Celsius), it's known as a cool flame or a low-temperature fire, according to a statement NASA. A typical candle burns at about twice that temperature. A low-temperature fire has no visible flames, but is still technically burning. Cool flames appear on Earth, but something about the microgravity environment makes such fires behave in entirely different ways than they do on Earth. An investigation called Cool Flames will "examine low-temperature combustion of droplets of a variety of fuels and additives in low gravity," according to another statement from the agency. Dan Dietrich, co-investigator for Cool Flames at Glenn Research Center, said during a media briefing on Wednesday (Oct. 5) that low-temperature burning is tied to the efficiency of standard engines, including those in cars. Thus, the study of cool flames is relevant to the development of more efficient engines for use on Earth. NanoRacks, a private company that helps other businesses get experiments onto the space station, has a group of experiments going up in the Cygnus craft that will utilize the company's new Black Box technology. This provides researchers with the opportunity to adjust their experiments during flight, but without using up valuable crew time. If, for example, a chemical experiment needed to be mixed or combined during flight, normally, a crewmember would have to conduct that task. Black Box uses robotics and various instruments (which can be controlled from the ground) to complete those types of tasks during flight. "Crew time is very valuable, and we want to replace some of that with automation that we can actually achieve now with some of the technology we have available," Mary Murphy, senior internal payloads manager for the Black Box at NanoRacks, said in the media briefing. Another new experiment apparatus called the Controlled Dynamics Locker will also fly to the station aboard the Cygnus. The locker can shake, vibrate or move in ways that could help execute certain experiments, such as those that might require stirring a chemical mixture. The locker can also compensate for nearby vibrations, which could inadvertently disturb a delicate experiment. Scott Green, principal investigator for the Controlled Dynamics Locker at Controlled Dynamics Inc., compared the stabilization aspect of the apparatus to the suspension system in a car, which ensures a smooth ride over bumpy roads. And the controlled motions of the apparatus are like a massage chair with "precisely controlled vibration frequency and magnitude." The Cygnus will also carry additions for the Lighting Effects investigation, which will study the effects of a few lighting system on the station crew. The new system is "designed to enhance crew health and keep their body clocks in proper sync with a more regular working and resting schedule," according to a statement from NASA. "The system uses adjustable light-emitting diodes (LEDs) and a Dynamic Lighting Schedule (DLS) that varies intensity and spectrum of the LEDs in tune with sleep and wake schedules," the statement said. "Research has shown that enhancing certain types of light can improve alertness and performance while other types can promote better sleep."